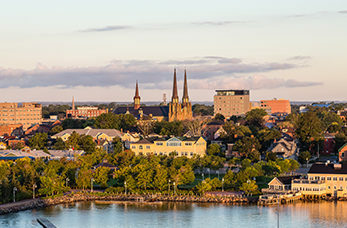 The flourishing city of Charlottetown is the capital of Prince Edward Islands, named after the wife of King George III it's the smallest of the country's provincial capitals. Charlottetown is known as the birthplace of Canada, in September 1864 the famous conference that led to the unification of Canada was held in Province House. Discover the stunning national park features unique cultural resources such as Green Gables houses, it features red sandstone cliffs and seven white sandy beaches. Explore the original 19th century gardens and farmyard located in Cavendish, and immerse yourself in the landscape that inspired the setting of the much loved novels "Anne of Green Gables." This delightful summertime destination is famous for its spectacular red sandy beaches, stunning harbour and beach. Province House stands as a landmark in Charlottetown, built between 1843-74 it's the seat of the Parliament of Prince Edward Island. Learn about the history of this historic event through guided tours, visual displays and presentations.